We’ve just added the most significant records available for Finnish genealogical research to MyHeritage SuperSearch — a huge collection of 33 million digitized Finland Church Records. The records in the Finland Church Census and Pre-confirmation Rolls, 1657-1915 collection were maintained by the Lutheran Church in Finland and cover nearly 300 years, providing insights into the entire population of Finland during this period. Almost everyone with Finnish roots will be able to find their ancestors in this collection, follow them over time and across various locations in Finland, learn more about their lives, and ultimately extend their family tree by many generations and make fascinating family history discoveries. While parts of the Finnish church records could previously be found online, such as non-indexed images, they were never entirely indexed or searchable, until now. Under agreement with the National Archives Service of Finland, MyHeritage is the first to have undertaken the challenging project of indexing the church records and pre-confirmation books. They are now available online for the first time, fully indexed and searchable, and only on MyHeritage. This collection is the most significant resource for anyone with Finnish roots because of the unmatched quality and quantity of the genealogical information it provides. It is likely to remain the most valuable collection of Finnish historical records ever published online.The records contain a wealth of information. Household members are listed together, and family relationships are included. More recent records include birth dates (and often the birthplace if the person was born in a different parish), marriage dates (or a note indicating that the person had married), death dates (or an indication that a person had died), a note about where a family had moved from or where they moved to, and a note about the individual’s reputation, physical or mental disabilities, etc. Church census records, also known as household examinations, church surveys, communion books, and confirmation books, registered each parish’s inhabitants by village, farm, and household (family group). The purpose of the church census was to record the results of each parishioner’s yearly catechism exam: reading ability, understanding of the Christian faith, and participation in the sacrament of Holy Communion. Survey books usually covered five or 10-year time-periods. For this reason, record dates in this collection are presented as year ranges. A village consisted of a grouping of farms in the same area; often several families lived on one farm. In cities, these records were organized by quarter or street, rather than by village. Sometimes single people and non-landowners were listed alphabetically at the end of a book. Households often consisted of multi-generational family groups — parents with adult children, the children’s spouses, and their grandchildren. Because of the way these families are listed, incorrect parent-child and spouse relationships may have been inferred in the index. In addition, early records did not always list relationships. Because the collection covers almost 300 years, the data entered varies dramatically over the years. Earlier surveys are less robust, whereas more information was recorded in later years after standardized forms were introduced in 1780. Surveys may include names of each household member (including servants and farmhands), relationship to head of the household, birth date, birthplace, and other information regarding catechism, communion, baptism, vaccination, or occupation. Information on marriages, deaths, or when and where a family moved was sometimes recorded. The Lutheran Church was the state religion in Finland for hundreds of years. Official Finnish church records began in 1686 — when a royal decree mandated that the church must keep records. However, some parishes had already been keeping records for several decades so that some records can be found from as early as 1657. Gustafsdr, Gustafsdotter, Gostafsdr, Gostafsdotter, Gustafd, Gustafdotter, Gustafdtr, Gustafdr, Gustaffsdr, Gustaffsdotter, Gustafsdt, Gustafsdotter, Gustafsd, Gustafsdtr, Gustavsdtr, Gustavsdotter, Gustavsdr, Gustofsdtr, Gustofsdotter, Gustofsdr, Gustsdr, Gustsdotter. Pre-confirmation books are also known as children’s books and pre-communion books. These records were mostly recorded in parishes in Eastern Finland. They list the names of children not yet confirmed or who had not yet received first communion (younger than ages 14-16). Pre-confirmation records are organized similarly to church census records. Children are listed by residence, and with their parents. Once children were confirmed, they were no longer recorded in the Pre-confirmation book but were instead listed with the family in the church census record. Johan Ludwig Runeberg is commemorated as a national hero in Finland: Runeberg Day (Runebergin päivä) is celebrated annually in Finland on February 5, his birthday. A pastry flavored with almonds called Runeberg’s Torte is available in stores from the beginning of January through February 5, and there is a statue of Johan Ludwig Runeberg, by his son Walter Runeberg, in the heart of Helsinki. Johan was also selected as the central motif of the Finnish commemorative coin, the €10 Johan Ludvig Runeberg. In a Finland Church Census record from the year range 1838-1847, Johan is listed with his wife. It lists his full name, country, parish, farm, and birth date. Another Church Census record for the years 1848-1857 lists Johan with his wife, but also adds children: Ludvig Michael (born 19 Jan 1835), Lorenzo (born 8 Dec 1836), and Walter Magnus (born 29 Dec 1832). A Pre-confirmation Roll record from the year range 1838-1847, shows Johan with his wife and the three children mentioned above plus two more children: Johan Wilhelm (born 8 Feb 1843), and Jacob Robert (born 7 Mar 1846). The record lists his full name, country, parish, farm, and birth date. A Pre-confirmation record for year range 1848-1858 adds a sixth child, Fredrik Carl (born 7 Oct 1850). From the year 1837, Johan served as professor of Latin literature in the Gymnasium of Porvoo. The record lists Johan’s occupation as a professor, as can be seen below. As another example, we found in the Finland Church Census record collection is a record for famed composer Jean Sibelius’ parents, Christian Gustaf Sibelius and Maria Charlotta Borg, and older sister Linda Maria. The record is from the parish of Hämeenlinna, from a book that covers 1858-1864. Jean was born there in 1865, and later when he was married with children, he lived in Tuusula (Järvenpää). This newly digitized content is already available for searching in SuperSearch, our global search engine for historical records. In addition, our Record Matching technology will automatically bring you relevant historical records from the new collection that match individuals in your family tree. If your family tree is not yet on MyHeritage, upload your family tree as a GEDCOM file, and you can immediately benefit from Record Matches from this collection. Searching the Finland Church Census and Pre-confirmation Rolls is free. A subscription is required to view records and Record Matches. The fully indexed and searchable Finnish Church records, along with millions of scanned original documents, can be found only on MyHeritage. We invite you to discover your Finnish roots, search this invaluable collection today and learn more about your ancestors. 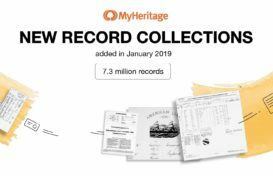 MyHeritage was the first company to digitize and release the Swedish household examination records, and then multiple Danish Census records from the years 1906-1930. With the addition of the Finland Church Census and Pre-Confirmation Books, 1657-1915 — we continue to lead Nordic genealogy. But we’re not done! We’re continuously working on digitizing more records to help you learn more about your ancestors’ lives and uncover your past.